Sunday’s Monster Energy NASCAR Cup Series race at Auto Club Speedway belonged to Kyle Busch. But nobody should overlook the accomplishments of his older brother early in the season. Kurt Busch left Stewart-Haas Racing after a successful five-year run. He took over driving duties for Chip Ganassi Racing’s No. 1 car, bringing sponsor Monster Energy with him. 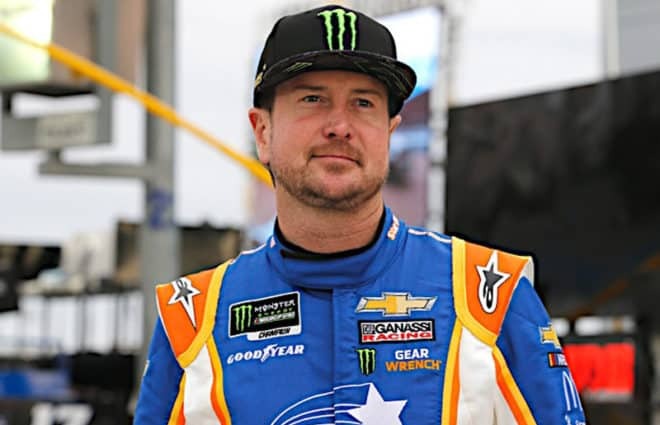 Busch’s deal is reportedly for one year, and it has been rumored that this season could be Busch’s last as a full-time Cup Series driver. Yet Busch has gotten off to a strong start with his new team. After struggling through a rocky Daytona 500, he has posted four straight top-10 finishes. Busch narrowly missed earning three top fives in four races, slipping to sixth in the closing laps at Auto Club. Still, who expected Busch to be this fast with a new team right off the bat? After all, CGR is coming off a year of frustration. With Jamie McMurray at the wheel, the No. 1 team recorded only two top-five finishes all season. Busch has already passed that mark, and he is halfway to matching McMurray’s eight top 10s from 2018. Busch’s new teammate, Kyle Larson, spent more time at the front of the field than McMurray did last year. But once the final checkered flag had fallen on the 2018 season, the No. 42 team had the same number of wins as the No. 1 – zero. Larson came close, sometimes agonizingly close, to winning on several occasions. He lost a late-race duel with Kyle Busch at Bristol Motor Speedway in April. At Chicagoland, the two drivers faced off again, fighting all the way to the final lap when Busch booted Larson out of the groove in a thrilling finish. Perhaps the worst loss was in the Southern 500, when Larson dominated but failed to hold off a late challenge from Brad Keselowski. Bringing Busch aboard was a smart move for CGR. The best-case scenario was that he would be able to get the No. 1 team back up to speed and challenging for wins. But heading into 2019, Larson figured to be CGR’s top contender for victories and the championship. It was only two years ago that Larson won at Auto Club Speedway, the first of four wins in a breakout season that saw Larson challenge for the title for the first time. If nothing else, Busch would be a good short-term solution for helping out Larson. Suffice it to say that Busch is nobody’s wingman right now. He outperformed Larson on Sunday at a track that is supposed to be one of Larson’s best. In fact, Busch has been outperforming all of his manufacturer teammates as well. 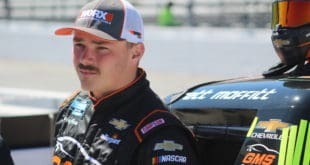 He was the only Chevrolet driver to finish in the top 10 on Sunday, and has been the highest finishing Chevy in three of the first five races. Perhaps more impressive is that Busch is the only Chevy driver to have earned a top five this season. Since he has been outrunning his Chevy teammates, consider who Busch has been finishing near lately, especially on the intermediate tracks. At Atlanta Motor Speedway, Keselowski and Martin Truex Jr. joined Busch in the top five. He also finished just ahead of his ex-SHR teammates Kevin Harvick and Clint Bowyer. The quartet of Keselowski, Truex, Harvick and Bowyer combined to win 17 races last year, nearly half the season. Harvick and Truex also advanced to the championship race. Las Vegas Motor Speedway had a similar top five: both Busch brothers, Keselowski, Harvick and reigning champion Joey Logano. Excluding Kurt Busch, that group won 22 races last year. And on Sunday, he was once again battling the younger Busch, Logano, Keselowski and Harvick in the closing laps, plus Ryan Blaney. It is very significant that Busch is running well at tracks like Atlanta, Las Vegas, and Auto Club, because tracks like those make up the bulk of NASCAR’s schedule. 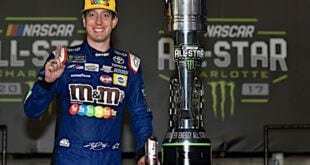 Over the last few seasons, Busch’s victories have tended to come at short tracks, quirky tracks like Pocono Raceway, and in the 2017 Daytona 500. That’s not a knock against Busch at all, because those tracks are some of the most challenging in NASCAR, and his Daytona 500 win is arguably the biggest of his career. But for most of his time at SHR, Busch only felt like a fringe championship contender. 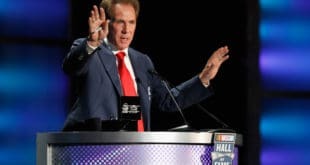 He was good for a win or two every year, but you never expected him to jump up and start reeling off victories in the postseason because he won so infrequently at types of tracks that are fairly unique. He did win a rain-shortened race at Michigan with SHR, but the last time Busch was a favorite at the intermediate tracks was around 10 years ago, when he was piloting the No. 2 car for Team Penske. Maybe Busch and CGR are in the process of building something special, something which neither party really thought about a few months ago when the team formally announced Busch would take the No. 1 car. Busch did praise his team after Sunday’s race and indicated that they are heading in the right direction. If Busch and CGR do improve on a couple little things, the No. 1 will be back in Victory Lane before long. Ganassi’s team may have Chevy’s best hope for a championship, but not the driver everyone expected it to be.